Non-profit Foundation Livio Sciutto utilize the open-source software OSIRIX for displaying patients x-rays DICOM images, either they come from compact disc or from PACS hospital system. As a matter of fact Osirix is able to act like a PACS node query/retrieve, both used as single position and through a centralized server to which to Foundation can turn to - using the web-interface as well- for consulting diagnostic radiographic exams. Osirix is also directly interfaced with GAP II system, for building together with a complete device dedicated to prenotations, hospitalization, surgery, follow-ups and multimedial documentation of the patients hospedalized in the centres affiliated to the foundation. Osirix gives an open architecture to "plug-in", with this it's possible to extend the potential: with OSIRIX it's possible to manage and visualize DICOM images of every type, MRA and TC included, whereof it's possible to obtain extraordinary tridimensional reconstructions, which match against the expensier dedicated workstations as for quality and realization timing. The best response of OSIRIX technology is made up of a specific plug in for the hip pre-operative planning. Planning at the moment is a universal custom recognized from othopedics all around the world, and includes the using of dedicated templates containing the graphs specifications of the main prosthetic implants of different producers; these templates are superimposed with the physic x-ray of patient' pelvis, and with appropriate misurations is, indeed, "planned" the surgery session. The result is a "project " that will lead the surgeon during next surgery, dimensions and prosthetic components alignment that have to be used included. Since years the foundation is looking for an electronic system able to transform this "manual" practice into a semi-automatic system, but most of all into digital, able to increase the precision and to create a real standard easy to distribute and adaptable in various hospitals; A lot of attempts have been made with some of the most important software producers, dedicated to medical branch specifically for the PACS background without have good outcomes. 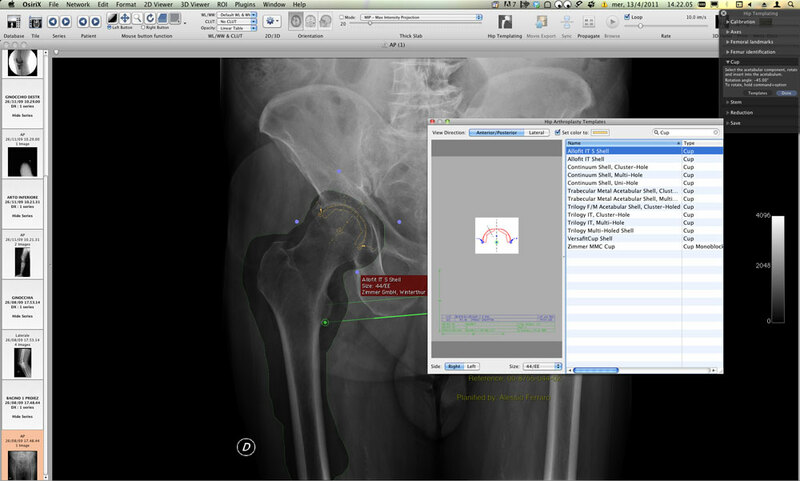 OSIRIX, and the relative hip planning plug-in have accomplished the task. Basically the surgeon retrieves the DICOM exam of the patient, and on this, once the system is quickly in scale, carries out the classic planning but with a completely digital format using prosthetic template superimposed on a digital x-ray, and obtaining numerically pelvis length discrepancy, type of implant, components dimension, and it's accurate to within a millimetre. At the end of the planning it is possible to save this by writing directly on the PACS server and registering, also for legal reasons, what it's meant to be done which will have to be compared with the post-operatives images. We define precisely that Livio Sciutto foundation is the only authority licensed that has exclusive contracts with the large part of orthopedic prostheses producers, capable to carry out a computerized pre-operative planning. Possibility of looking through plannings straight from the web in real time. 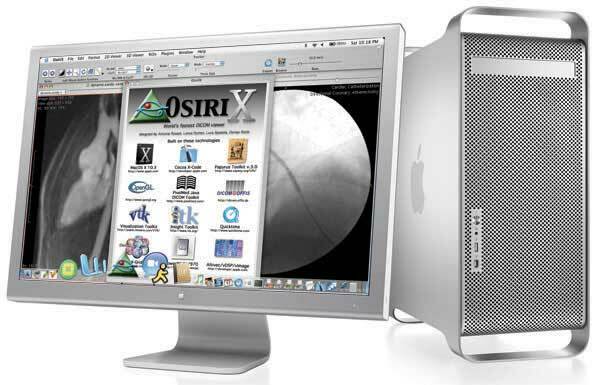 Osirix system requirements are not particularly high: software works on whichever Apple Macintosh computer supplied with Intel processor, Snow Leopard operative system or higher, and there's not any cost for the software as it's an open-source material. Foundation is able to provide it's own know-how to demanding centres, through proper convention with the foundation, in order to give out the knowledge and increase the experimentation of this great instrument. Moreover, foundation enables to provide tecnical support for turning traditional templates into digital formats, following the specifications required from planning plug-in.